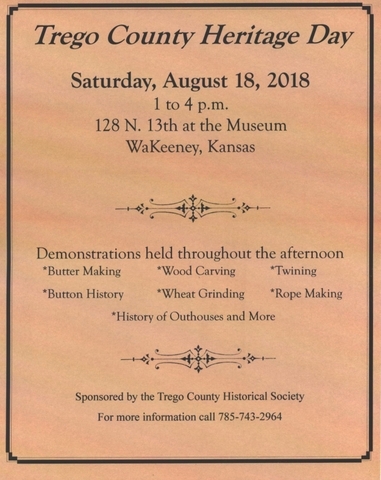 Come join us on Saturday, August 18, for Heritage Day at the museum in WaKeeney. The event if open to everyone and will run from 1 to 4 p.m. Demonstrations will be held throughout the afternoon in butter making, wood carving, twining, button history, wheat grinding, rope making, and the history of outhouses. Other displays and presenters are being confirmed.